Add-Only: Allows adding new events. Existing events stay as read-only and cannot be changed. Newly added events can be modified only during a single, time-limited browser session (approx. 30 minutes). Add-Only, No Details: Same as add-only, but event details are hidden. The newly added event remains editable until the current session expires, then it becomes read-only. Modify-from-Same-Link: Allows adding new events and editing existing events that have been created using the same link. Otherwise the entries are read-only. Modify-from-Same-Link, No Details: Same as Modify-from-same-link, but details for existing events are shown only if they were created using the same link; otherwise, the event details are hidden. When is add-only the right choice? The add-only permission is helpful when users contribute events to the calendars, but should not modify existing events. A calendar access link with add-only permission could be shared with a large community, even open to the public, and all users can use the same link to add events to the calendar or to selected sub-calendars. The creator of an event can edit their event submission during the current browser session up to 30 minutes. Once the current session is expired, the newly added event becomes read-only to all. The Project: Data Migration event was just added and doesn’t have the lock icon yet. This indicates that it is still editable by the creator of the event. After 30 minutes, the lock icon will be displayed on the Project: Data Migration event. The lock icon indicates that the event is now read-only and cannot be modified or deleted. Local community events (e.g. sports, entertaining, church services). See here how using the add-only permission can help with setting up an approval system. When is modify-from-same-link the right choice? When a calendar needs to be modified by multiple users. When each user needs to add and make changes to events that they created. When users need to add or modify their own events, but not those created by others. The modify-from-same-link permission allows multiple users to edit events on the same sub-calendars, but only make changes to the events they created with their own calendar link. A unique calendar link with the modify-from-same-link permission can be created for each user or for a user group. Each calendar link can be named with the user’s name for easy recognition. This would make tracking event changes and calendar modifications easier, as the link name is used in the logs. See here for more information. Users who have calendar links with the modify-from-same-link permission can create, modify, and delete events, but only events they created, not those of others. This reduces the amount of unintentional deletions or modifications. Calendar links can have modify-from-same-link permission to certain sub-calendars, and another permission type for other sub-calendars, making calendar access highly flexible. For example, a team member could have modify access to his or her own sub-calendar, and modify-from-same-link permission to the shared team calendar. 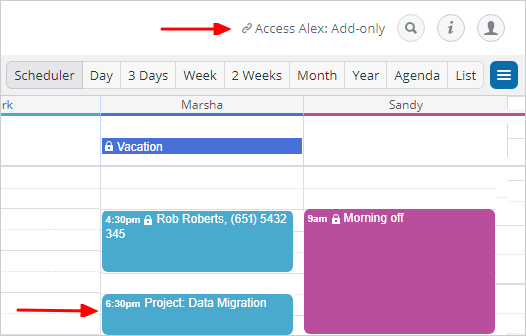 Teamup makes it easy to deactivate, reactivate, or delete calendar links at anytime. This makes the modify-from-same-link option useful not only for long-standing group members, but also for ad-hoc coordination needs. Should an individual user with a modify-from-same-link calendar link (or any permission, for that matter) no longer need access to the calendar, then it would simply be a case of deleting their link. No other users would be affected. This is a big advantage. More on managing calendar links. Amy Hamilton can only modify her own events. All the rest can’t be edited; note the lock icon. Class reservations of school computer labs. Conference room reservations in companies. Shared equipment or space bookings for sports clubs. Boat reservations in homeowner communities. See this Live Demo to play around with this type of calendar permission in action. Engineering services performed at customer sites, such as technical installations and maintenance. Freelancing professional services, such as coaching, training, project management, etc. Shared meeting rooms in office buildings available for booking by multiple tenants.